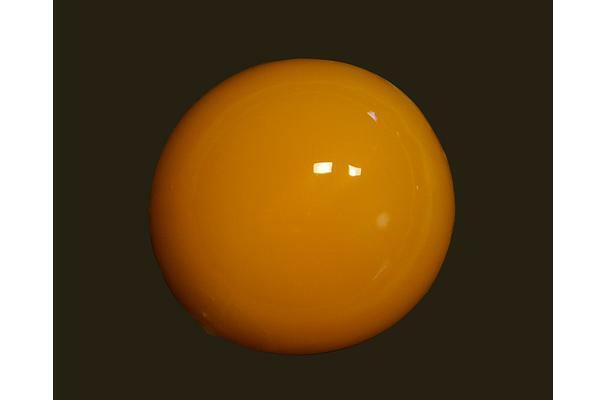 The yolk of an egg can range in color from light to dark yellow, depending on the diet of the bird from which it comes. The yolk is the part of the egg that is high in both fat and protein, and also provides a good source of iron and other essential vitamins. Egg yolk is an excellent thickener and emulisifier for sauces and a key ingredient in mayonnaise, custards, and hollandaise sauce. Brushing pastry with egg yolk adds color and shine. The higher the yolk rises above the white when you crack an egg on a plate, the fresher the egg. Soft, round, gelatinous and "jiggley"
Choosing: #1 ALWAYS check the freshness of the egg right before you want to consume the yolk. #2 If you are uncertain about the freshness of an egg, don't eat it. #3 If it smells 'weird', don't eat it. #4 If there is a crack in the shell, don't eat it. #6 To be able to properly judge the freshness of an egg, it's contents need to be at room temperature; eggs that are stored in the fridge and are opened right away seem fresher than they are. The eggs that you want to check freshness of, should be kept outside the fridge for at least an hour prior to opening them. #7 First check all the eggs by rolling them across a flat surface. If they don't roll wobbly, don't consume them. #8 Secondly: shake the eggs; when they dash, don't consume them. If the egg white is watery instead of gel-like, don't consume the egg. If the egg yolk is not convex and firm, don't consume the egg. If the egg yolk easily bursts, don't consume the egg. #11 The first 3 days that you consume fresh raw egg yolk, take only one teaspoon of it, so that your defense system has the time to adapt to the small amount of bacteria in the egg. The next 3 days you can take one whole egg yolk. And the next 3 days after that you can take one yolk more, and so on. That way your defenses system will be properly trained to fight bacteria, so that even if you eat something really bad in the wrong restaurant with your friends, your bowels will maximally move too much while your friends may be seriously ill.
Buying: Most of the time you can't buy egg yolk alone, it comes with the egg and you just have to remove the yolk alone. Eggs on the other hand can be bought at your local wet and super market or grocery store. * It is sometimes separated from the egg white and used in cooking (for mayonnaise, custard, hollandaise sauce, crème brûlée, avgolemono, and ovos moles). * It is used in painting as a component of traditional egg-tempera. * It is used in the production of egg-yolk agar plate medium, useful in testing for the presence of Clostridium perfringens. * Egg yolks also contains spermcells antibody called antiglobulin (IgY). The antibody transfers from the laying hen to the egg yolk by passive immunity to protect both embryo and hatchling from microorganism invasion. * Egg yolk can be used to make liqueurs such as Advocaat, or mixed drinks such as eggnog. If you have spare egg yolks left after making a dish that only required the whites, it is possible to keep them a little longer while you work out what dish to use the yolks in. Here are some suggestions for storing egg yolks safely. Pour each yolk into a separate compartment of a large ice cube tray or freeze together in a small container with a lid. Cover the ice cube tray with a freezer bag. Place in the freezer. Use within the month. Put the egg yolks into a small container. Cover the yolks with either water or a small amount of melted butter. Put a lid on the container. Place in the refrigerator. Stored in this way, the egg yolks will keep for up to 5 days, refrigerated.